Create a timeline report for tables that contain scheduled items, like tasks, projects or similar events. Timelines are a handy way to graphically represent your project schedules. You can create a timeline report for any records that have a start date and end date (typically tasks or projects). The period of time you want to examine. The timeline resolution. Here, you specify the time increments you want to use in your report. Whether you want the report to highlight milestones. The start and end dates for the event you want to track. Tell Quick Base which period of time you want to examine. Set a Starting Date and Ending Date for your timeline report. If you make no selections here, Quick Base automatically sets the report time span for you based on the start of the earliest event included in the report and the end date of the latest event. Tell Quick Base how to break down your timeline. Timelines always measure time in two increments. You can view events by any of the following combinations: week/day, month/week, quarter/month, fiscal quarter/month, year/month, year/quarter, or fiscal year/quarter. When you select a resolution, Quick Base always expands the duration your timeline shows to include a full instance of the highest level time increment. For example, if you've chosen July 23 as a starting date, but selected Month/week as your resolution, the timeline will start on July 1st, the beginning of the first month. Timelines must show the entirety of the highest resolution increments. Use the application's default setting – Application managers can define the fiscal year for each app by specifying the first month of the fiscal year. Once set, this default becomes the default setting for the application. If the application manager chooses not to change this setting, the first month of the fiscal year defaults to January. In either case, you have the option of using the application's setting for any timeline report you create. Define a separate fiscal year for this report only – You can also choose to define the fiscal year for this report only. You may choose to use this setting if, for instance, the application manager did not set the fiscal year for the application. This option gives you a quick way to generate a fiscal year timeline on the fly. You can also define whether the first or last month determines the year of the fiscal year. For example, a company's fiscal year runs from August 2011 through July 2012. If the fiscal year is based on the first month, then the fiscal year is 2011. If the fiscal year is based on the last month, then the fiscal year is 2012. You can change this setting in the application's Date/Time options. Read set calendar options for the application. 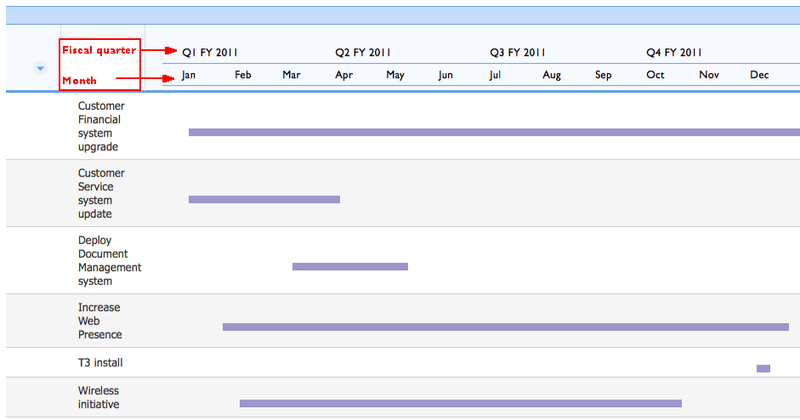 Within the Starting Field and Ending Field dropdowns beneath the timeline diagram, select the fields containing dates that represent the beginning and finish of each record event you want to track. For instance, if you want your report to show the timespan between each project's start date and its projected end date, choose Start Date for the Starting field and Planned End Date as the Ending field. You can group your timeline by a specific field like Company, Project or Status. Read more. You can even create subgroups and nest them within your highest level group. Use sorting/grouping settings to create a nested timeline. For example, say you'd like to show your client how their projects fit on your staff schedule. A nested timeline can show your customer the projects and tasks you're executing for him as well as who's responsible and when it's all happening. To create a timeline like this, set three levels of grouping. First, sort and group from high to low by Customer Name, then sort and group from high to low by Project Name, then sort and group from high to low by Assigned To. To show records in chronological order (within the final group), sort by Start Date. To show all groups in chronological order, follow the instructions to sort groups by the starting field, below. If you've created groups and want to sort them chronologically, turn on the Sort groups by starting field checkbox in the Sorting & Grouping section. For example, if you've created a timeline of tasks and grouped it by project, the project headings appear in alphabetical order. Turn on this checkbox, and Quick Base reorders how your projects appear in the report. The project containing the task with the earliest start date moves to the top of the list. This creates a cascade effect, as illustrated in the image below. The checkbox appears only if you've grouped records. Click REPORTS & CHARTS to open the reports panel, then click + New. In the dialog, select Timeline and click Create. In the Filters section, specify filter criteria. Choose the columns you want to display in your report. Choose whether you want to include a define a calculated column for your report. When you're done, click Display on the Page bar to view the results of your modifications. If you don't like the results, click the Customize button at the top of the page to return to the Report Builder. Save the report. To do so, you will need to supply a name for the report, and whether you're saving the report as Personal (only you can view it) or Common (others can view it). Optionally, you can also assign the report to a group. If you've displayed the report, you can save without returning to the Report Builder. To do so, go to the prompt by the report title and click Save as. To display and save at the same time from within the Report Builder, click Save. You can only save a common report if the manager of the application has granted you permission to do so. When you save a common report, you don't need to allow absolutely everyone access to it. Quick Base prompts you to select the roles that should see it. To share with all application users, select All Roles. (An Application Manager can change which reports a particular role can access at any time. To learn how, see Specifying Which reports a User Can Access.) To help others understand what your report shows, type in a description. If you want the description to display above the report, turn on the Show description on report page checkbox.